We are an affluent name of the industry engaged in manufacturing and supplying a finest range of Magnesium Stearate. Magnesium Stearate is a magnesium salt of Stearic acid. 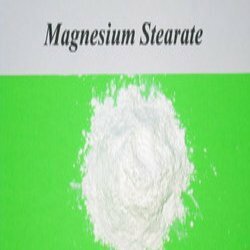 Magnesium Stearate is chiefly mixture of magnesium stearate as well as magnesium palmitate. Magnesium Salt is a white substance, powder which becomes solid at room temperature. We hold immense industry experience in delivering a durable consortium of Magnesium Stearate. Manufactured by making use of optimum raw Chemicals and advanced technological tools, these products stand tall on the defined parameters of the industry. Moreover, quality checkers recruited with us dispatch this range after thorough consideration of industry laid parameters.